Our most in-demand products. Ready to ship today and arrive in 2-3 weeks. A curated selection of our most in-demand products. Ready to ship today and arrive in 2-3 weeks. Whether by phone, chat, or in-person, our Design Specialists can recommend fabrics, create floor plan drawings, and even recommend solutions beyond what you’ll see on our site. Not sure which fabric to choose? ship them to you, free of charge. Have no fear, our Design Specialists can consult with you on products, fabrics, and more. 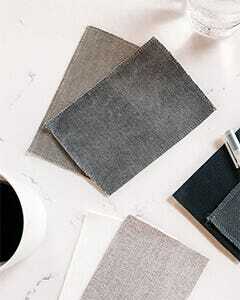 Whether by phone or chat or in-person, our Design Specialists can recommend fabrics, create drawings and moodboards. They’ll help you with solutions beyond what you’ll see on our site. We’ll hold production until you’ve selected your fabric. Please note that colors may vary based on your device and settings. To most accurately view fabrics and colors, we encourage you to order free fabric swatches. We offer additional lengths beyond what you see here. We can even extend the length of a sectional chaise. Contact one of our Design Specialists for details. Orders are typically delivered in 8 to 12 weeks. Get five fabric samples shipped to your door. The Owens custom sectional sofa is perfect for city apartments, but its clean-lined simplicity feels at home anywhere. A slightly curved arm and a low back create visual appeal, without adding unnecessary frills. The Owens sectional sofa's seat cushions are crafted from high-resilience foam that’s wrapped in poly fiber, delivering a sturdy-yet-comfortable sit. Poly/down-blend back cushions welcome you to lean back and stay a while. 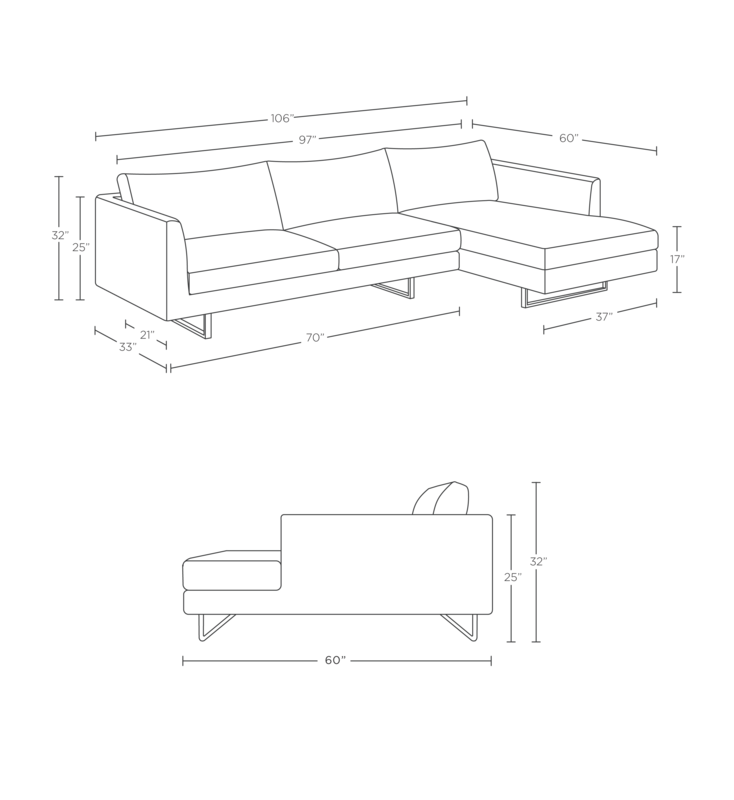 Our furniture measurements are calculated from each piece’s widest or tallest points. Cushion overhang beyond the frame, the crown (highest point) on a fully fluffed seat cushion, and outward curves and angles are all included in the overall dimensions. Will this piece fit in your space? Learn more with our guide to measuring for delivery. Below are some easy steps to extend the lifespan of your piece. CLICK HERE for our full Construction & Care guide. Dust leather regularly with a soft, dry cloth. Attend to stains as soon as possible. Blot spills with a clean, dry, white cloth. Work from the outer edge to the center of the spot. Leather is a natural product, and both texture and color will vary slightly from hide to hide. Inherent variations make each piece unique. In addition, the colors that appear on your screen may not be accurate due to color variations in monitors. We encourage customers to order free swatch samples, which are available here. From factory to front door; leading to extraordinarily fair pricing. Furniture made-to-order; enabling unique customization. Design driven, quality centered. We're obsessed with quality control. People loving. One point of contact and a 100-day return policy. See what customers are saying here. Download our augmented reality app for iOS to visualize this pieceour products in your home. See photos from our customers’ homes. Get up to five free fabric samples shipped to your door, free of charge. Match your sofa or choose from 70+ fabrics and leathers. A beautiful, cross stitch weave with a highly durable profile. Kid and pet friendly. A soft microfiber fabric with an exceptional durability profile. Kid and pet friendly. A sturdy and durable fabric with a beautiful woven, textured hand. An excellent option for its bight mid-century color palette and its kid and pet friendly profile. Kid and pet friendly. A distinctive v-shaped woven pattern, paired with a soft hand for a timeless look. A heavy-duty cotton-poly blended fabric with an authentic distressed look. Kid and pet friendly. A soft felt hand with exceptional, performance durability. Kid and pet friendly. A hefty weave of multiple colors blended together for a textural weave. Kid and pet friendly. A sturdy, tightly woven, and durable fabric with a smooth hand. A textured, plush hand with a distinct linear weft. Shades of one color blended together on a sturdy, yet super soft fabric. Kid and pet friendly. A slubby, woven-blend that forms a unique and sturdy texture. A crisscross weave of two colors to create an interesting, durable weave. A luxurious and heavyweight velvet with a perfect, subtle sheen. The tightly woven blend offers a durable profile, making our velvet a beautiful and livable option. Kid and pet friendly. A soft woven dyed to resist UV light and protected against mold and mildew. Kid and pet friendly. Buy your pillow now and select a fabric later. A full pigment-dyed, top-grain buffalo leather with a subtle sheen and smooth, soft touch. Please note, our Night leather pillows are backed with Heavy Cloth Panther fabric to allow the insert to breathe. This distressed top grain buffalo leather is pigment-dyed in a true brown that compliments almost any style. Please note, our Palomino leather pillows are backed with Heavy Cloth Natural fabric to allow the insert to breathe. This top grain buffalo leather is pigment-dyed in a medium brown with red undertones, creating an overall rich and warm color. Please note, our Pecan leather pillows are backed with Heavy Cloth Natural fabric to allow the insert to breathe. A top grain cow leather pigment-dyed in a true gray, this is one of our most versatile colors. Please note, our New City leather pillows are backed with Heavy Cloth Ore fabric to allow the insert to breathe. Choose Pillow Fill Choose our down alternative, polyfill if you have a down allergy, or simply prefer to avoid down. Sign up to receive inspiration, product updates, and special offers from our team. Available 9am–9pm CST, 7 days a week. Use it to see our pieces in your space. Interior Define for iOS - see our pieces in your space.